Several years ago while living on 11 acres on a dirt road in rural South Georgia, I served on a volunteer Fire Department. We received the gamut of calls ranging from house fires, car fires, automobile accidents, attempted suicides, and flooding to name a few. One rainy night, our department was dispatched to assist a neighbor whose home was being threatened with flooding by a large highway drainage ditch which was rapidly overflowing. 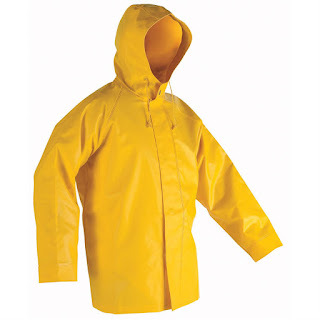 I walked into the utility room of our farm house and began pulling on my bright yellow rain gear complete with jacket and hood with a built-in bill like a baseball cap. I began thinking how miserable it was going to be out working in this torrential downpour. I pulled up the hood on the rain jacket and walked out of the utility room towards the backdoor of the house where I met our 3 yr old daughter. I could feel some pride rise in my chest that my young daughter was seeing her father preparing to go out in miserable weather to help someone. For a mere moment, I thought I would earn some admiration and respect for my civic duty. She looked me head to toe, paused for a moment, and said, "Daddy, You look like a duck!" I quickly realized she was right and was brought back to reality. There was no need to feel sorry for myself. Someone was faced with their home being flooded and that was worse than being out in the rain to run a pump. With my ego in check, I crawled into my pickup and headed to the scene. Along the way, I glanced in the rear view mirror at myself and the yellow billed hood of my rain gear, chuckled, and did my best Donald Duck impression. Thanks for reading and writing KT!